The Edmonds Sons of Norway Pancake Breakfast and Bake Sale is May 5, 2018 7:30am-12:00pm at the Edmonds Masonic Center, 515 Dayton Street. Breakfasts are a hearty portion of Norwegian pancakes with strawberries and syrup, ham, juice, coffee tea, and milk and cost $8.00 for adults and $5.00 for kids 6-10 (under 5 are free). Enjoy live music and after you eat, visit the craft and bake sale tables. Kids can participate in free folk dancing lessons between 10am-noon. The 17th of May Festival (Syttende Mai) is hosting the annual parade in Ballard on Thursday, May 17, 2018. 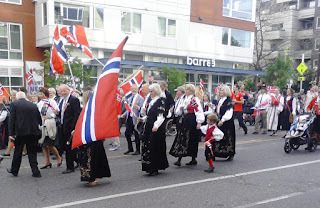 The parade begins at 6:00pm through downtown Ballard in Seattle and features many Norwegian organizations with an impressive variety of Norwegian bunader (traditional and folk clothing). More details here. May 5 and 6, 2018 is the grand opening celebration of the new Nordic Museum in Seattle. The Sons of Norway is the largest Norwegian organization outside of Norway with a mission of preserving and promoting Norwegian heritage and tradition through cultural and social activities offered at local and district lodges. For more information about the Edmonds Chapter of the Sons of Norway (Norwegian ancestry NOT required) contact 2018 Lodge President Norma Jean Sands 206-524-6020. Sons of Norway meetings are held the second Wednesday of each month January through June.